Prosecutor Hannu Koistinen claims that Bouanane’s action went beyond a random act of terrorism and that he is an ISIS supporter. ‘Bouanane has seen his action as an expression of support for the Islamic State’s operation and their ideology,’ Koistinen said today according to Vasabladet. 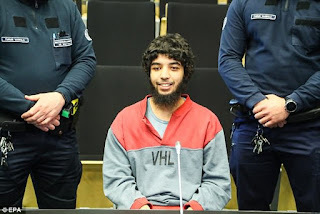 Bouanane had claimed to be a 17-year-old boy called Abderrahman Mechkah when he arrived in Finland in 2016, and applied for asylum as an unaccompanied minor. His true identity, revealed in court documents, could be established following an international police investigation after his arrest, local media reports. Finnish police have previously said Bouanane targeted women when he launched the attack at a market square in the southwestern port city on August 18. Two women were killed and six women and two men were injured, including a British paramedic now living in Sweden. Victim Hassan Zubier, from Kent, was stabbed in the neck, chest and back by Bouanane as he tried to help one of the female stabbing victims who died in his arms….